With humbled hearts and consoling minds, the staff of S. Jones F. and C. serves notice that on Saturday, September 22, 2018, Daisy Pearl Martin, 101, of Enfield, NC, has layed down the cares of this world in the medical facility of Hunter Hill Nursing and Rehab. From there, she picked up her new wardrobe and golden keys for her everlasting life in Heaven. The family has reserved Saturday, September 29, 2018 at 3 pm, to Celebrate Her Life and Legacy in the sanctuary of the White Oak Baptist Church 1612 White Oak Rd, Enfield, NC 27823. 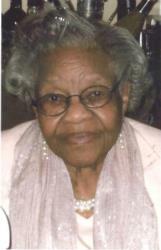 The remains of Ms Martin will lie in state one hour prior to the service. Her mortal frame will be laid to rest in the church cemetery. Daisy was one of a kind. She will always hold a special place in my heart. You can rest now Aunt Daisy. We love you. Sheryl,Louis and family. To the family, I am so sorry for your loss. During this sad time, please know that our Heavenly Father assures us of his loving support in times of grief, and he promises to end the pain of death by means of his kingdom (Psalm 34:18, Daniel 2:44, and Revelation 21:3,4). In the days to come, may these verses provide encouragement for your family. Take care. Accept my sincere condolences in the "homegoing " of your loved one. Know that I and so many other people are lifting you and your family up in prayer. God bless and keep you! I am going to miss cousin Daisy here on earth where she radiated her love for family and touch so many lives. I know you are with GO. The family should be happy that she is with the Lord. . Please accept my heartfelt condolences. Please take much comfort in Christ heartwarming promise made to us, John 5:28,29. Soon we will see our loved ones again. Just as Christs friend Lazarus fell asleep in death, He reunited him with his family and friends and has extended that same promise to our dear loved ones, John 11:11-14; 17-26. May you cherish your fondest memories until the day you reunite with your loved ones. I have memories of a great aunt from my childhood to my children childhood. Aunt Daisy holds a special place in the hearts of me and my sons Corey, Rotwaun, Ciji, Tyonne and Duce. Our shared experiences of traveling together and living as neighbors in Eagle Square Apartments will always keep her memory alive.